Watch the full episode. See more Your Vote. President Obama's insistence that BP pay for all damages has resulted in the high positive step of BP to set up an escrow account of $20 billion. Do Republicans see it that way too? The president just called for creating a fund that would be administered by outsiders, which would be more of a redistribution-of-wealth fund. And now it appears like we'll be looking at one more gateway for more government control, more money to government. But if I was the head of BP, I would let the signal get out there -- 'We're not going to be chumps, and we're not going to be fleeced.' And they shouldn't be. They shouldn't have to be fleeced and make chumps to have to pay for perpetual unemployment and all the rest -- they've got to be legitimate claims. I do worry that this idea of making them make a huge escrow fund is going to make it less likely that they'll pay for everything. They need their capital to drill wells. They need their capital to produce income so that they can pay that income to our citizens in Alabama, Mississippi, Florida, Louisiana, and to pay for all the damages done. BP needs to pay, is supposed to pay, must pay every penny. But this escrow bothers me that it's going to make them less able to pay us what they owe us. BP’s reported willingness to go along with the White House’s new fund suggests that the Obama Administration is hard at work exerting its brand of Chicago-style shakedown politics. And Rep. Joe Barton R-TX even apologizes to BP! 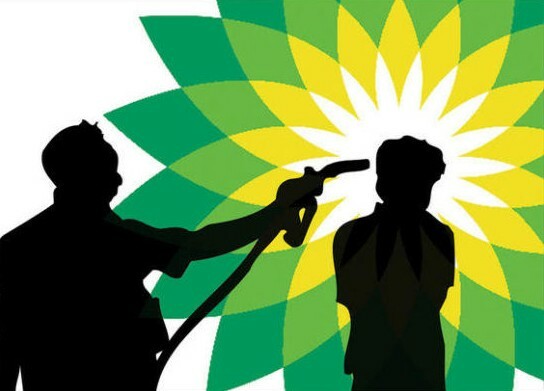 BP's actions have been criminal in nature. While it cannot make the oil in the Gulf dissolve; it is striving to dilute its culpability to a great extent. This needs to be met forcefully head on. Multi-national corporations ought not despoil our shores and expect to pay dividends to shareholders. Our leaders should address with clarity the ethical liability of BP and propose both a forceful action plan to deal with this specific company and to layout the consequences of amoral economic distancing of any corporate misdeed in the future. Let us now seize the high moral ground and then occupy it for the long term. We should urge our representatives to imediately pass a jobs bill that employs on a fast track both primarily public and some private individuals in a modern green CCC and a program on par with the 1960's space program to address long delayed needs in environmental denigration, immediate repair of disaster damages, and vastly increased research and development of deployable alternative energy. And without reservation, now is the time to refine and submit a climate bill to Congress because BP's oil spill highlights the need for urgency. We here in Maine nominate our presidential candidates through the caucus/convention process. With that one exception, all other partisan candidates are nominated through primaries. Since our primaries only a few weeks away, lawn signs are popping up here like mushrooms after wet weather. We have five Democrats (one a write-in) and seven Republicans running at the moment, so you can imagine the crop of signs, most of which will be useless (OK, I’ll admit I save the wickets) after the primary. It occurs to me that, in a time when state budgets are squeezed between a rock and a hard place, when state funding for education is cut forcing local property taxes to make up the difference, when workers are looking at pay cuts, we need to take a long, hard look at our system of primaries. In 2007, Maine’s Secretary of State considered asking the legislature to cancel the state-funded primaries which, at the time, cost an estimated $300,000. Primaries are strictly partisan activities, and forcing all the voters (including those ineligible to vote in a primary) to pay for them is just plain unjust. So what’s the answer? Ask the state party organization to pony up the cash? I doubt they could here in Maine. I believe the solution is to look to Utah, in which candidates are chosen in county and state nominating conventions made up of delegates chosen at the local level. I realize some of you will disagree, and disagree strongly. “Caucuses are inherently undemocratic,” you will say. Having participated in many of them, I would have to disagree. Any member of the party is invited, public notice is a requirement, and those who cannot be there have the same right to vote absentee as they would in a primary. Becoming a delegate is easy (even in 2008 every alternate ended up being upgraded to delegate), and anyone who can’t afford the $38 cost can get the fee waived. I realize that lots of folks feel that caucuses are some sort of smoke filled room with access granted only to party “insiders” but that honestly hasn’t been my experience. In Maine, spend an afternoon helping stuff envelopes, and you become an insider, I guess. Nominating through the caucus/convention route would also reduce the cost of getting onto the November ballot enormously, thus empowering candidates who prefer to rely more on small donors than on large corporations. Finally, particularly in a party which takes grassroots organizing seriously, there would be the great benefit of increased, very personal, participation in the process of choosing a candidate. Attending a caucus where you have a chance to discuss your candidate of choice, and attempt to convince your neighbors to support that candidate, is a wonderful experience and leads to increased levels of volunteerism between nomination and the general election in November. Having volunteers creates more of a level playing field for candidates who don’t want to be beholden to large donors. So….the cost is lower, both for candidates and taxpayers. Participation is open to the same group of party-affiliated voters who now are permitted to vote in primary elections. Candidates will not need as much corporate money to get on the ballot, since their campaigns will be volunteer-powered (if they prefer to work with the grassroots). "I am writing to express my grave concerns regarding the severe economic impact of a six-month (or longer) suspension of activity at 33 previously permitted deepwater drilling rigs in the Gulf of Mexico, including and in particular the 22 deepwater drilling rigs currently in operation off the Louisiana coast." Yes, it is Bobby Jindal whose state is being severely impacted by oil damage from an offshore rig in the Gulf of Mexico writing to President Obama after criticizing him for mot being hard on BP regarding the spill. "We don't understand why our federal government would be making excuses for BP. They're the responsible party. They're the ones that caused this oil spill... it is their oil that is showing up in our coast and our wetlands and our marshes." Robert Reich asks if the recession growth in entrepreneurs is just another unemployment or under-employment indicator in this thoughtful New York Times Op-Ed. I have certainly observed this happening in Maine. It is the Great Recession's equivalent of the Great Depression's street corner sales of apples and pencils.